OTTAWA (CUP) â€” The Canadian Federation of Students (CFS) celebrated its 30th anniversary last week at its 60th semi-annual national general meeting held just outside of Ottawa. Nearly 250 delegates convened in Gatineau, QC to discuss student issues at the twice-yearly event, this time held from Nov. 22 to 25. Feb. 1, Ã la rue! 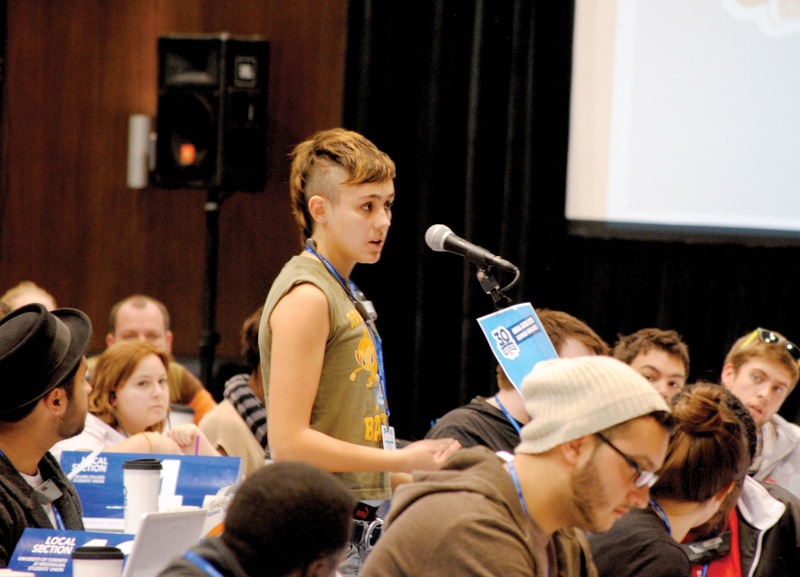 Campaigns, budgets and executive reports were all debated and passed, but the overarching theme of the four-day-long conference was the upcoming national day of action on Feb. 1, 2012. Keynote speakers Justin Trudeau, Liberal member of Parliament, and Nycole Turmel, NDP interim leader of the Official Opposition, both pledged their support for Feb. 1, much to the appreciation of delegates. “This year is really defined by the national campaign,” said CFS national chairperson Roxanne Dubois. According to the CFS, the Feb. 1 protest will be multifaceted, targeting the reduction of tuition fees, reduction of student debt and increased education funding. For Dubois, two topics stood out at this year’s national general meeting. “The ‘Education is a Right’ campaign and the day of action obviously are one, because we’ve actually been able to talk about it in various caucuses, and different constituency groups were able to identify some materials that would enable them to connect to the campaign more directly,” she said. The second was the soon-to-be-launched “No Means No” website and mobilization to prevent violence against women in the lead-up to the Dec. 6 commemorative events in remembrance of the Ã‰cole Polytechnique massacre in Montreal in 1989. During closing plenary, delegates voted for their new national executive for 2012â€“13: the national chairperson, the national deputy chairperson and the national treasurer. Candidates in each category ran unopposed and all were elected. Adam Awad, current national deputy chairperson, and originally from the University of Toronto Students’ Union, will take the position of national chairperson. Jessica McCormick of the Memorial University of Newfoundland Students’ Union will become national deputy chairperson and Michael Olson of the Vancouver Island University Students’ Union will become national treasurer. All three will officially assume their new positions next spring. “I’m actually really excited to have such a diverse [team of] at-large members … I’m really excited to be able to work with three incredibly strong provincial components and to bring the lessons that they’ve learned from the different parts of the country and I think it’s really important to not just have an Ottawa-centric, and Ontario-centric, perspective on how to get the message out,” said Awad on his election. Mark LaRiviere of Trent University had the last words from the floor at closing plenary and though his first experience at a CFS national general meeting left him feeling motivated, he had some reservations about its structure. “I was told, odds are if you’re a white, male, undergraduate student, [and] heterosexual, then there’s very few constituencies that you can fit in,” said LaRiviere. Constituency groups are “composed of individual delegates who share a common characteristic as recognized by the federation,” such as students with disabilities, francophone students and international students. “It’s very established within the structure of the federation to create a space for groups that are traditionally excluded from many decision making processes, and so that’s the recognition of very evidenced social inequalities that we recognize and that we allocate a space for,” said Dubois. “I feel strongly towards many of the issues … it was a bit of a downer, just because I felt like I could definitely be an advocate for a lot of them,” said LaRiviere, who did not end up participating in any of the constituency groups. Overall, the meeting was characterized by a strong sense of unity among delegates, and there was very little variance in discourse. For the next two months, the national office will be concentrating on the planning and roll-out of the upcoming national day of action.